Since over 20 years, the Transport & Planning research program is a coherent program, performed by a well-cooperating group of researchers at assistant, associate and full professor level. The focus on fundamental research, with an empirical basis and application-oriented perspective has resulted in many coherent research projects that have been successfully completed. The mission of the Transport & Planning has retained its value and strength during the review period: to achieve top-level fundamental research that contributes to a more efficient and robust design and reliable operation of transportation systems that meet mobility demands and respect scarce resources of land, environment and people. It is part of this mission to produce and disseminate new insights and tools to support professionals (planners, designers, authorities, infrastructure managers, transport and traffic operators) in transportation planning and management practice. Equally, the mission includes the contribution to top-level MSc- and PhD-education in transportation. From this statement it follows that the research is predominantly knowledge-driven with a clear perspective to society-driven applications using a multidisciplinary approach. The primary target audience is the scientific community; the professionals and policy makers form a second important target group. The objectives as formulated in the previous assessment (2005-2010) can be summarized as follows. T&P aims to continue its research according to its basic research philosophy, that is performing fundamental research with a multi-modal and multi-class perspective, using rigorous quantitative approaches and based on original empirical data. T&P aims to perform the research predominantly in the form of PhD research projects within highly interconnected subprograms of the Research School TRAIL and NWO programs. T&P aims to continue research into fruitful and promising subjects and approaches such as traffic flow theory, traffic management, rail traffic, multimodal networks, etc. Particular research fields to be intensified are cooperative and automated driving, regional transport planning models, transport networks and transport infrastructure design and assessment, traffic safety, driving behavior and geometric design. T&P aims to make new investments in data collection, analysis and modeling tools, as a sustained basis for solid and innovative research results. New investments pertain in particular measurement equipment (Bluetooth, UAV, instrumented vehicles), traffic and travel data collection and processing facilities and traffic and transport modelling facilities. 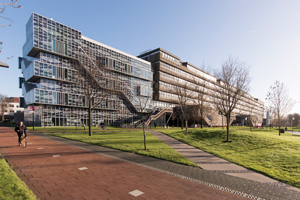 T&P aims to take a leading role in further strengthening scientific quality and societal visibility of transport research and education at TU Delft. It will further strengthen cooperation with other faculties at TU Delft. T&P aims to execute a master plan for the replacement of retiring staff members, focusing on scientific and educational excellence and to recruit a full professor Transport Networks and Transport Infrastructure.